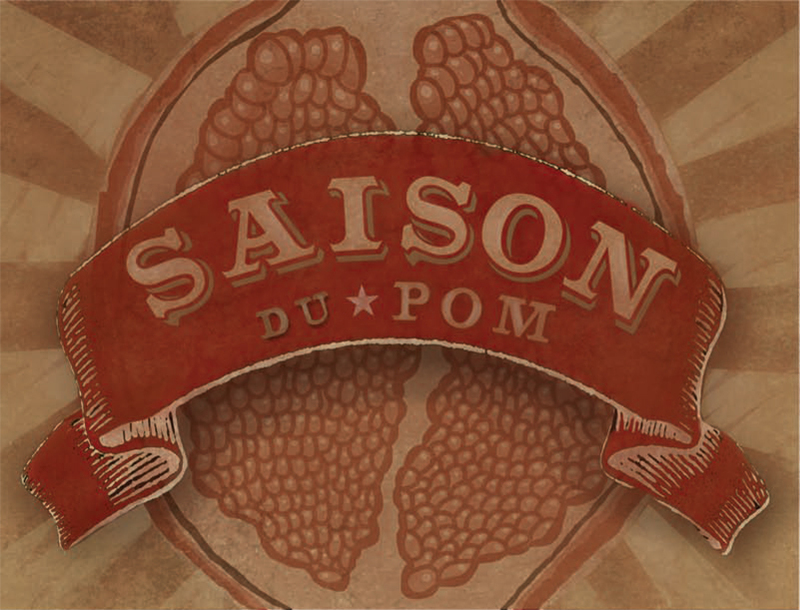 After tasting my pomegranate saison at bottling, I was a bit concerned with whether or not it would have any fruit character. There was nothing in the beer to suggest fruit at the time, so I decided to prime with more pomegranate molasses. I simply calculated the amount of priming sugar I would need, and then multiplied it by the ratio of the total mass of molasses to the mass of sugar (i.e. according to the nutritional facts there is is x grams of sugar in y grams of molasses). 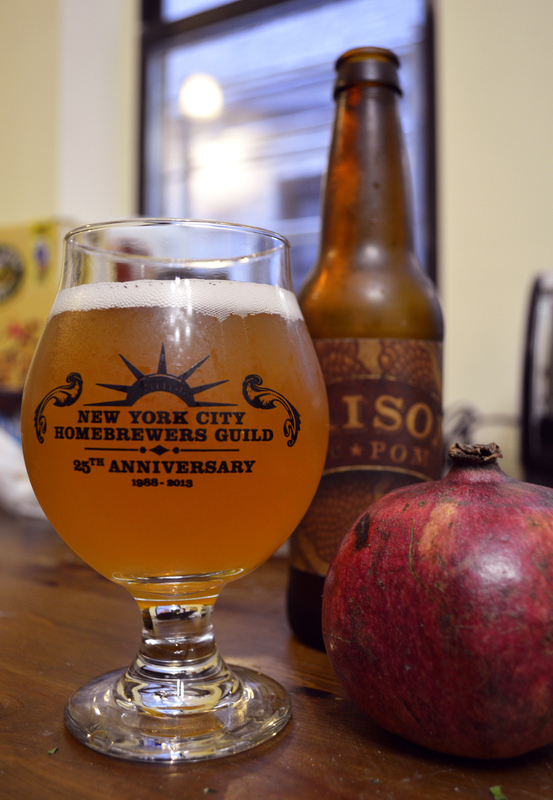 I didn’t get a chance to taste it until I was serving it at a New York City Homebrewers’ Guild meeting. The priming method completely transformed the beer. Colleen designed yet another terrific label for me. This particular label went through several iterations of ideas and ended up far from the label’s original conception, according to Colleen. On to the beer itself. Appearance: Hazy, tarnished bronze. Must be poured aggressively to develop any kind of head. The head retention is not great, with the head subsiding in a bit over a minute, leaving just a scant a ring of foam lasting around the surface of the beer. No lacing. Aroma: Big pomegranate with slight grain underneath. The pomegranate smells like the pomegranate molasses, which I’m not quite sure is the scent of pomegranate, but then again I’ve never smelled pomegranate juice. Flavor: Again quite fruit forward, although I’m not convinced that the pomegranate molasses has exactly the same flavor as pomegranate. Either way it’s probably close enough. Low bitterness, but a sort of peppery finish that may be coming from the continental hops or the yeast. Slight saison yeast tang. Mouthfeel: Right on target in terms of body, neither too full nor too thin, but the beer leaves a syrupy feeling in the mouth. By the end of the glass, it gets to be pretty cloying. Overall: By the end of a single bottle I’m a little sick of this beer. It doesn’t have any glaring flaws, but the mouth-coating quality just becomes overwhelming. The beer is also a little one-dimensional, and that one dimension unfortunately doesn’t excite me as much as I’d hoped. Colleen liked it quite a bit, although she also noted it’s a bit on the sweet side. Colleen’s label work and my beer smithing made their mark at Bitter & Esters beer swap. I wrote up these notes just before going to a brew swap at my local homebrew shop, Bitter & Esters. It’s always a lot of fun sharing my beer there as Bitter & Esters always creates a friendly, helpful, and welcoming environment. As the night concluded, the co-founder, John La Polla asked who would win a pint glass for the best beer of the night. We all agreed that it should go to a mead that someone made using honey harvested from bees he keeps on his roof, but that fellow had already left. After more pointing and voicing of opinions, I ended up with the prize, so at least in small doses I think the beer must make a pretty strong positive impression. It’s possible I will make it again some day, but currently it’s not on my brewing docket (which is planned out to next August). If I brew it again I will probably tinker to bring more flavors into play. I would note, however, that this brew does compare favorably to a pomegranate wheat I tried at a bar a couple weeks ago, so I’m not completely discouraged. 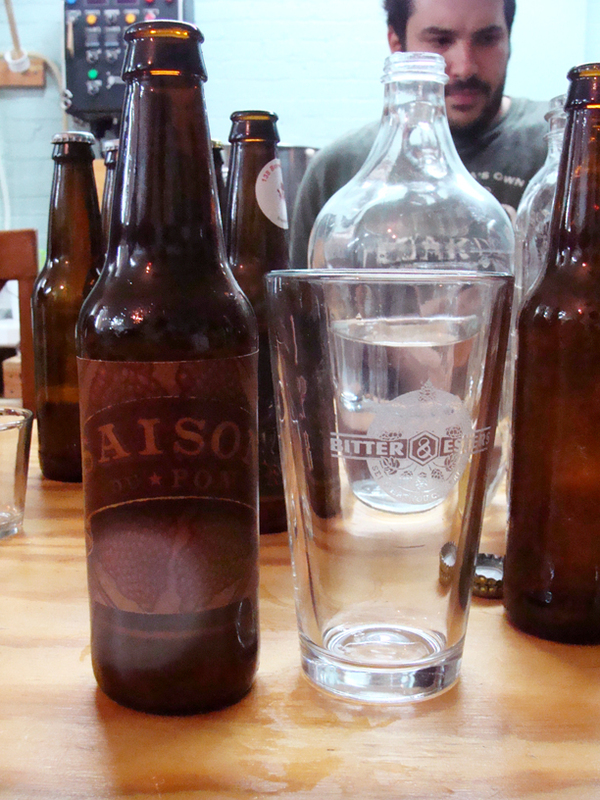 This entry was posted in beer, tasting and tagged fruit beer, homebrew club, NYCHG, review, saison on October 3, 2013 by Dylan Bargteil.